Let me start by sharing some of our history and background. The Company (Navneet Gems) was established by Mr. Suresh Agarwal in 1993 in Jaipur, India. Working under the guidance of his father, Mr. Om Prakash Agarwal, learning valuable skills and knowledge about all facets of the industry. We widened our reach to the world by exploring industry parts of the USA (Our biggest consumer market), Europe, Japan and eventually establishing base camp in Germany. Navneet Agarwal, son of Suresh Agarwal, decided to take the operations at Navneet Gems and Minerals to a professionalized level and completed his Graduate Gemologist degree from G.I.A Carlsbad. After completing this degree he has moved on to taking the Gemstone business to the next level where quality, punctuality and delivery is of the utmost importance. “It’s important to grow together and not individually” – Navneet Agarwal. After a few years of exponential growth for the company, Suresh decided to shift operations to Bangkok, Thailand to tap the emerging market’s behavior. Which is a little closer to his Motherland of India. From that day forward we have never looked back. Navneet Gems now does 7 Jewelry Exhibitions per year, we could do a lot more but we aim to focus on quality as opposed to quantity, thus allowing us more time to focus on being an environmentally friendly gemstone company, focusing on Wholesale ethically sourced Gemstones. Our team members are well versed in the industry and put you, our client first! Being an environmentally friendly Gemstone company with wholesale ethical gemstones, let us explain ourselves a little. Ready? OK. The 21st century is all about being innovative and developing new ways to ensure a better future for everyone. Navneet Gems and Minerals is one of the world’s rare Gemstone companies that focuses on Corporate Social Responsibility. This means that we strive to ensure our Gemstones are; free of human rights abuse, we abide by and follow fair labor practice, we focus on community development, we’re environmentally friendly and our Gemstones do not finance Civil Wars. Most Gem shoppers will know that they have to consider, color, cut as well as clarity before purchasing gems. However, what they usually don’t consider is that when these gems are not mined responsibly or ethically it leads to environmental destruction, corruption on all levels and jeopardizes the health and safety of local laborers and workers. (Good) There are processes in place for Diamonds like “The Kimberly Process” which tracks a stone from its origin and verifies that its sale is not supporting tyrannical regimes. However no such process is in place for colored Gemstones. This is one of our visions and responsibility for us as Gemstone manufacturers. With Gemstones there are no guarantees, but the more specifics a jeweler can provide, the more likely the stone was ethically sourced. 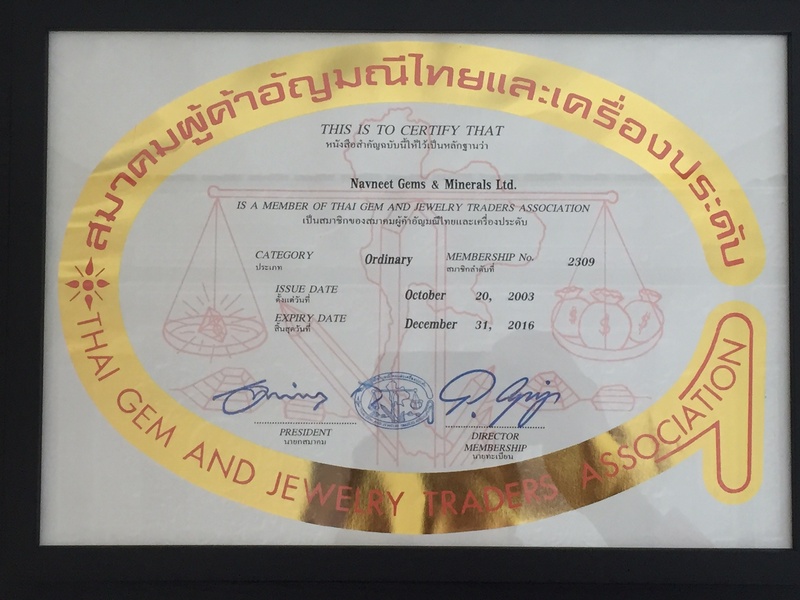 In a perfect world, your Gemstones journey from the mine to your local jeweler would be monitored by an independent organization that verifies which sustainable practices was in place every step of the way. Unfortunately we don’t, the industry is striving towards better accountability procedures and transparency. Make sure your supplier has some formal endorsements and certifications. This way you can assume that things are being done by the book. See the below picture for a reference of our own at Navneet gems. 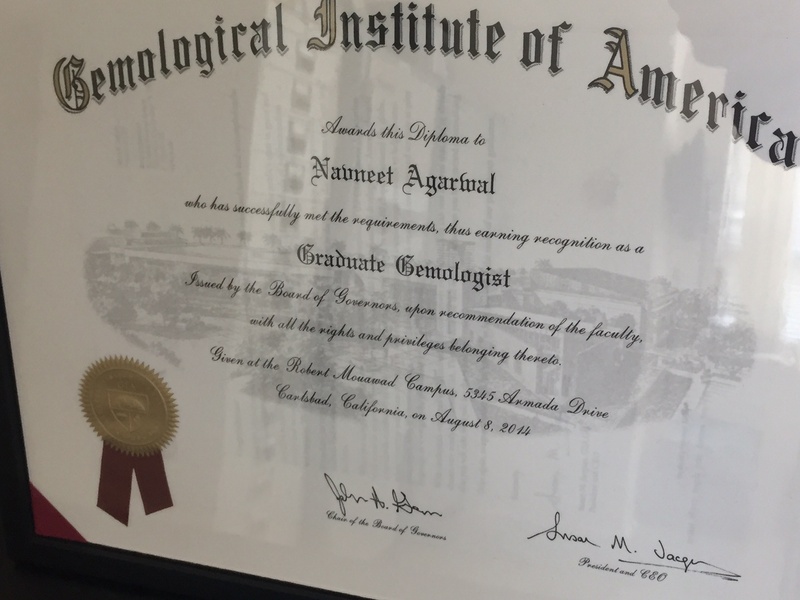 Navneet Agarwal has physically visited gemstone mines and witnessed first-hand all the factors that are incorporated into providing consumers with our finished product while attaining his GIA from Carlsbad. We are also currently in process of obtaining more credibility’s as well as CSR Certifications. Sadly it will still be a while before the everyday consumer can get clearer, more reliable information on the origins of that ruby that sits on your better half’s finger. All Jewelry is considered an emotional purchase. Try to picture yourself going to buy an engagement ring for your future wife, or some earrings for your mother on mother’s day. Would you feel comfortable knowing that these Gemstones that make up these pieces were obtained in unethical ways? For example child labor? Or slave labor, or knowing that this purchase will be in direct support of some radical regime that has no regard for basic human rights? Environmental Efforts- A primary focus for us is the environment, so any steps that we can take to reduce our carbon footprint is good for society and good for us too. Ethical labor practices – By treating our employees fairly and ethically, abiding by the labor laws, ensuring proper training, safety equipment provided and in good order, staff members trained in first aid, providing a safe and comfortable working environment. Factory conditions – The important aspects of the factory are Safety. We ensure this is taken care of by having the correct exit points, entry points, suitable dress code, flooring and roofing, first aid kits located in accessible locations and so on. Out of the many 100’s of mines that are available in the market in Brazil, we mention Brazil because we source in brazil as it is more transparent due to the development that has happened there. We choose to be very particular from whom we purchase raw topaz, amethyst quartz and citrine quartz rough from. We only source from those mines with conditions that we deem safe, ethical and responsible. If they fit all this criteria then these are the mines we end up working with. This selective process costs money, time and energy. We at Navneet Gems are very dedicated to working towards all the Corporate Social Responsibilities that a Gemstone company should follow and adhere to. Not only do the management follow these practices, all of our employees do.